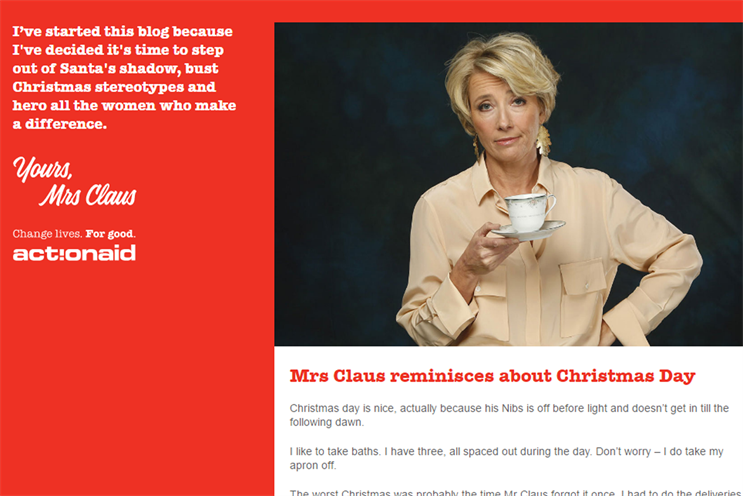 Following in the footsteps of M&S and Iceland, anti-poverty charity ActionAid UK has turned to the once overlooked Mrs Claus for its blog-based Christmas campaign. "Yours, Mrs Claus" is a collection of stories, anecdotes and ideas from both the eponymous wife of Santa, and a series of celebrity contributors including Emma Thompson, Jo Brand and Josie Lawrence – billed as Emma Claus, Jo Claus and Josie Claus. The blog, created by PR and creative agency Unity, was initially only accessible through fake clickbait links to articles like "14 ways to turn tampons into Christmas decorations" to "What your Santa fantasies say about you", which were seeded though Buzzfeed and influencers like career coach Amanda Alexander and spoof clean eating blogger Deliciously Stella. It is now unhidden and will be updated until Christmas. Jessica Holland, head of brand marketing at ActionAid UK, said: "Mrs Claus is often portrayed as a nameless, voiceless, stereotyped and hidden woman, which made her the perfect character to bring to life the story of the women and children we help around the world." "We didn’t have millions, so we made the mechanic the message – hiding the blog in plain sight, just like the women we help – creating a campaign that’s all about the journey. By doing this, we’re raising awareness of all the other women who need support but who we don’t see." Emma Thompson added: "I was inspired by this campaign and the synergy that it draws between the often ‘hidden’ Mrs Claus, and the work that ActionAid does to support some of the most marginalised women and girls living in the poorest parts of the world. "I have seen for myself how ActionAid champions these women and works with local volunteers to empower them to change their lives for good."